Pain is a signal from the body to the brain that something is wrong. Either the back is too weak, too inflexible or the wrong body mechanics were used to perform a task. Doctors who focus exclusively on pain symptoms often recommend treatment that is the exact opposite of what is actually needed. Historically, doctors have treated back pain with bed rest and heavy drugs to mask the patient’s discomfort. However, this type of treatment is actually more damaging to the back. It causes back muscles to weaken, which leads to more strain and pain. Patients became dependent on drugs and grew inactive and disabled. Pain relief can actually be achieved through movement. Low-impact sports such as walking and swimming are ideal in making the back feel better and stronger. Working with a therapist may be necessary for optimal recovery from back or neck pain. Therapists are able to relieve pain using specialized techniques, tissue and joint mobilization and personalized exercises. 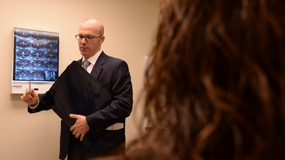 A therapist is also trained to recognize the boundaries of back and neck pain patients, in order to maximize therapy without causing further injury. Proper multidisciplinary rehabilitation programs are structured around returning patients to the tasks of everyday life. Once the collaborative effort has paid off, and this has been achieved, it is important to prevent future back attacks. In just about any job situation, there are going to be hazards that need to be avoided, whether it is sitting at a desk or working in a warehouse. 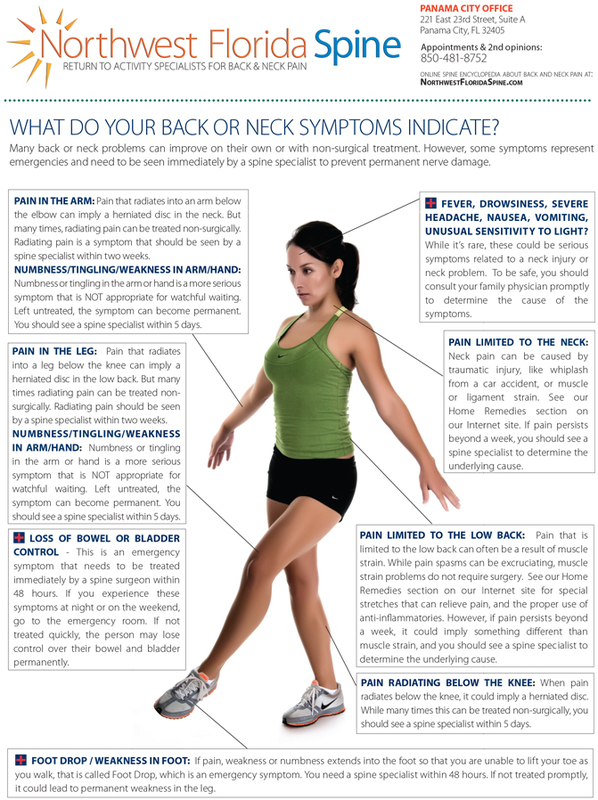 Click here for more specific ways to prevent back or neck injuries. You may have encountered the term "ergonomics," which is surfacing more and more in the workplace. Ergonomics is a science concerned with designing and arranging things people use in the safest and most efficient manner possible. Ergonomics is often applied to people who sit at a desk all day. While it seems harmless, sitting for long periods of time can actually cause back pain. It unloads weight on the back, especially if the chair is poorly designed. Make sure your chair molds properly to your back. Many employers concerned with the safety of their workers purchase chairs that support the low back. If you are too short or too tall for your back to rest properly in these chairs, or if your company does not offer ergonomically designed chairs, consider bringing in a rolled-up towel. Place it behind your low back to reduce the amount of stress on the back. Make sure your feet rest flat on the floor. If this is a problem, use a footstool. Proper foot and leg alignment will ease back stress. While typing on a computer, your forearms and thighs should be parallel to ensure proper shoulder alignment. If necessary, use a pad to support your wrists while typing. When you type, your neck should not have to crane constantly, as your eyes dart from keyboard to monitor. The monitor should be at eye-level or slightly below eye-level. Get up and move around every half hour, even if it's just a quick stretch by the side of your desk. Your back enjoys movement, so reward it occasionally. Many jobs involve standing for long periods of time, such as teachers and cashiers. People rarely equally distribute their weight onto both legs while standing. Instead, they tend to shift their weight from one side to another, throwing the spine out of alignment, which can lead to back strain. If you have difficulty standing without shifting weight, try standing with one leg on a footrest, periodically switching feet. Take a minute every now and then to do back exercises that will help loosen up stiffness. Muscles were designed to move and stretch. Sitting pulls muscles into a shortened position, causing stiffness. Also, the sciatic nerve, which runs between the spine and thighs, can be compressed by the weight of sitting for a long time. Just like at a desk job, driving for a long period of time can cause strain on the back. Many seats in cars are designed to support the spine properly, but even if your car was designed ergonomically, your height may differ from the height of the person the seat was designed for. Be sure to remove your wallet from your back pocket before a long drive, as it can place pressure on the sciatic nerve. To prevent back pain, stop and stretch every hour or so to keep muscles loosened up. Feel it out. If your back hurts after a long drive, roll up a towel and place it behind your low back to support the lumbar spine. A long drive in the car is often followed by an attempt to yank heavy suitcases out of the trunk. Watch out. Your back is at high risk of injury. Even if you have not been driving long distances, lifting heavy objects might be a normal part of your day-to-day tasks at work. Accidents are prone to occur during improper lifting. Mothers are also at risk when it comes to heavy lifting. Lifting a child can cause back strain if not done properly. To learn how to lift properly, click here.